Pre- and post-tests help you measure what you’ve learned in each module. The curriculum covers all eleven traditional radiology disciplines, plus appropriateness criteria, physics, and safety. Study Efficiently and Track Progress Ready-made lessons pull together all the information residents need to learn about a topic, while pre-tests and practice questions help determine where to focus valuable study time. Educators can easily review individual and program-wide reports on progress toward program milestones. The Faculty module provides access to the entire curriculum, including assessments, so you can see what your residents are studying. Topic-focused lessons present specific diagnoses, anatomy, differential diagnoses, and assessment questions related to the topic. Two curriculum levels deliver the right training for each resident level. The Basic level is for 1st-year trainees and provides topic introductions, imaging anatomy, and basic diagnosis questions. Intermediate is for 2nd-year and 3rd-year trainees, building on more advanced topics and imaging modalities. RADPrimer delivers the first comprehensive radiology curriculum, across all core disciplines and over 3,500 topics, to help you become a competent, confident radiologist. Elsevier’s team of experts contributes a lifetime of subspecialty expertise to your learning experience. Access RADPrimer anytime, anywhere. RADPrimer is web-based and optimized for access on an iPad® or a newer web browser. In Test mode (such as during pre- and post-tests), you will take all the questions in the test without hints or learning suggestions so you can check your knowledge. Questions in Tutorial mode give immediate teaching tips and lead you back to the lesson material that will strengthen your understanding. RADPrimer also includes hundreds of special questions, such as physics and safety and appropriateness criteria questions. Create custom quizzes to evaluate your learning retention. Flag questions for follow up. Select new questions or revisit previous questions. Pre- and post-tests measure your learning progress so you can see your improvement. For each key area, educators can see how individual residents are performing, how residents in a specific program year are performing as a group, and how residents in your program are performing compared to their peers around the world. Educators can also use this information to gain insight into areas of strength and weakness for individual residents, specific program years, and the entire residency program. Use key performance indicators for individual residents, such as time spent reading topics, number of questions taken, and average quiz performance statistics to help accurately gauge and document your residents’ progress. RADPrimer’s curriculum provides a consistent educational resource for every teaching faculty member in your program. Save time getting started with printable reading lists, department implementation suggestions, and recommendations on how to integrate with your resident tracking software. These time savers, combined with the faculty module training tools, makes reporting quick and easy. Can I use RADPrimer on my mobile device? Yes. RADPrimer is optimized for access on an iPad® and other tablet devices. However, because RADPrimer is a complete radiology curriculum, it is not optimized for small devices, such as phones. How do you select cases for RADPrimer? Our authors cover the globe and select exemplary cases for the teaching point they are making within RADPrimer. What kinds of questions are in RADPrimer? RADPrimer’s questions primarily focus on diagnosis. But we are expanding these questions to include anatomy, imaging findings, procedures, differentials, safety, physics, and appropriateness criteria. RADPrimer has over 7,000 questions covering diagnosis, differential diagnosis, anatomy, imaging findings, management, physics, and safety. How is this different from STATdx? 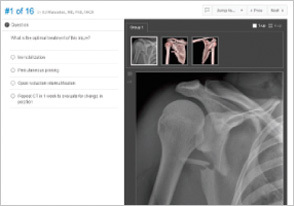 STATdx is designed for clinical decision support with over 6,000 diagnoses. 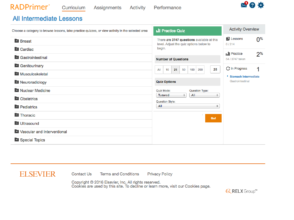 RADPrimer has a smaller expert-selected curriculum with related assessments. Where do RADPrimer case challenges come from? Case challenges are written by our renowned radiologist authoring teams located all over the world. What is different about RADPrimer? 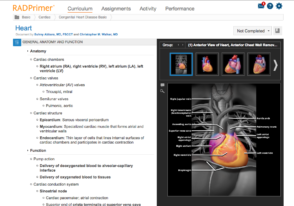 RADPrimer provides a comprehensive radiology curriculum, organized into lessons with corresponding learning objectives and assessments for each curriculum category. In addition, RADPrimer content was written by well-known radiologists who are thought leaders in each of their respective sub-specialties. Can I take quizzes the same way residents can? From within the faculty module, a faculty member may review all learning objectives, reading material, practice questions, and test questions for every lesson. When faculty review questions, the questions appear in an answered state and show answer justifications, captions, and teaching points within each question. How many people can access the faculty module? All of your faculty and program administrative staff can have access to the faculty module. Can RADPrimer help me keep track of the progress of residents in my program and help me identify where residents are excelling and struggling? Yes. RADPrimer reporting shows your overall scores in each curriculum category for each resident and resident year. This way, you can easily identify the areas in which residents are excelling and the areas in which they may need additional help.